I’ve been been quite the curmudgeon lately on the Windows Vista problems that are spoiling my ebook-reading experience on the Lenovo X61T. Affirmation is nice at times, and in that vein, a Microsoft guy has posted an admirably honest list enumerating the peskiest of Vista’s interface quirks (via Fake Steve Jobs). To these annoyances, add the serious wake-from-sleep bug(s) that have forced me to reboot the system three four times in the last three weeks. Never knowing if the system will actually work definitely puts a damper on my reading and other tasks, and being forced to work around the problem by waiting for a full shutdown/restart cycle every time I use the machine isn’t a whole lot better. These apparently aren’t isolated incidents, as evidenced by the many frustration-filled discussions of Vista’s deep-rooted problems. The upcoming SP1 update is supposed to address certain sleep-related issues, but I would be very surprised if the fundamental interface design problems are ever fixed. So is the bloom off the rose on Vista and the X61T? Yes. I haven’t thrown it out the window yet, but I am sometimes sorely tempted. It’s a shame, because actually reading ebooks is a pleasure on this machine but software problems are tarnishing the experience. Windows XP was chosen to run on all PCs handling chores vital to the Olympic Games, and has been installed on most of the PCs delivered by Lenovo Group. Vista will only be used on PCs in Internet lounges set up for athletes to use during the games. The Olympic Games require mature, stable technologies, said Yang Yuanqing, chairman of Lenovo, during a briefing in Beijing. The Olympic Games aren’t a place to try new technologies due to the size and importance of the event, he said. Everything must work smoothly. “If it’s not stable, it could have some problems,” he said. Yesterday, I talked a little about the various devices that might be used for reading ebooks. We decided to go ahead and order this guy — the one I put at the high end of the spectrum — a Windows-based tablet PC. Looking at the various tablets that are out there, this one on paper sounds like a good candidate. At just over four pounds and a little more than an inch thick, it’s at least in the ballpark for a comfortable read while lounging on the couch. With a transflective screen that Lenovo claims is very readable outdoors, it could be a good read out on the park bench, too. A claimed battery life of seven hours means I could sit on that park bench in real life for at least 3 or 4. The 12.1 inch display should be big and sharp enough to comfortably display a full-size PDF without having to squint. The screen responds to both stylus and a finger touch, so page flipping and note taking can be done with the most appropriate tool. 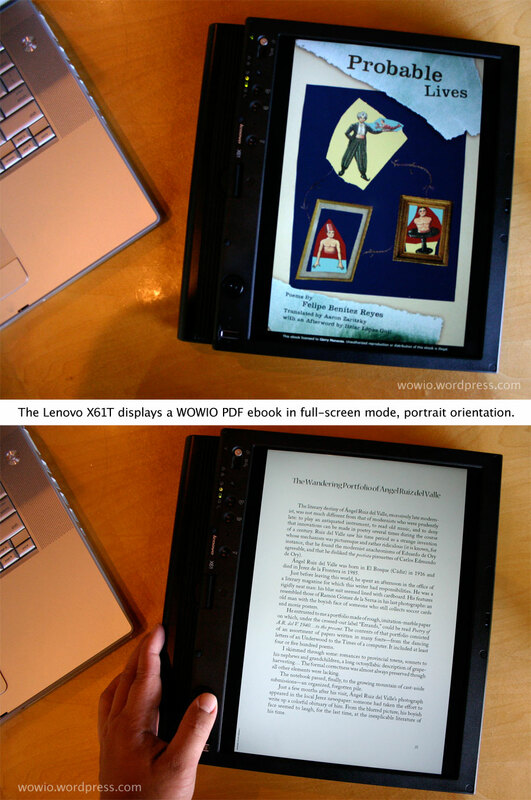 With a walk-out price of over $1800, it’s obvious that no one would ever buy this machine solely for reading an ebook. On the other hand, if you’re like me, you might need to have a laptop handy most of the time anyway so this might be a viable option (or, in my case, a good-enough substitute until Apple makes its own Mac/iPhone hybrid tablet!). When the machine gets here, we’ll know for certain and I’ll be sure to post the results here. Have you had any luck using a tablet for ebook reading? How about for day-to-day computing? Update: It’s in! Take a hands-on first look.